Assassin's Creed III is on its way to be released later this year and today Ubisoft has announced three Special Editions for the game. 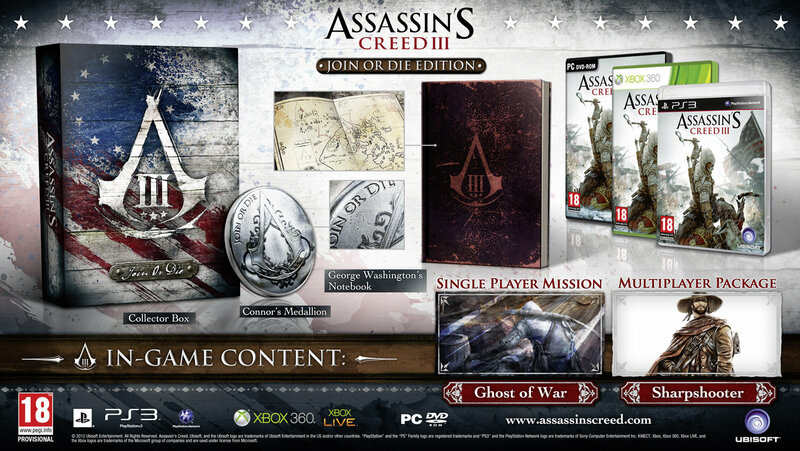 There's the Freedom Edition, the Join or Die Edition and a regular Special Edition. 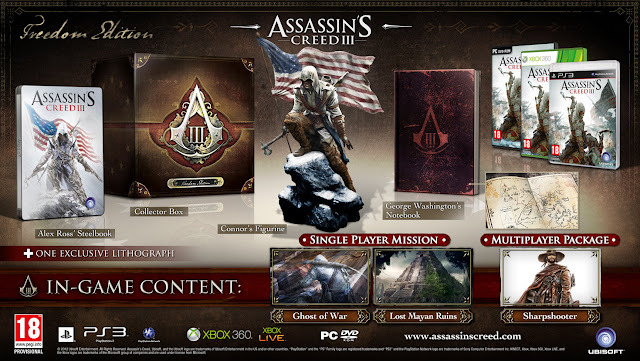 The Freedom Edition, the most notable of the set, offers the retail game (obviously), a 24 cm HQ figure of Connor, a steelbook case drawn by comic artist Alex Ross, George Washington's notebook containing all the secrets about the Assassins and Templars of the American Revolution, one exclusive Lithograph, 2 in-game Single Player Missions: Lost Mayan Ruins & Ghost of War and an in-game Multiplayer Package containing a new character, the Sharpshooter, a relic, emblem, special picture and title. The Join or Die Edition contains the game, The medallion of the Assassins, George Washington's notebook, an in-game Single Player Mission: Ghost of War and the in-game Multiplayer Package. 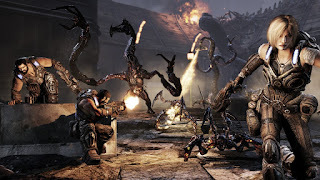 The Special Edition features a special packaging, the game and a special single player mission: A Dangerous Secret. No exact price point has been set but I'd say that the Freedom Edition is going to set you back a few. Assassins Creed III will be release on October 30th.